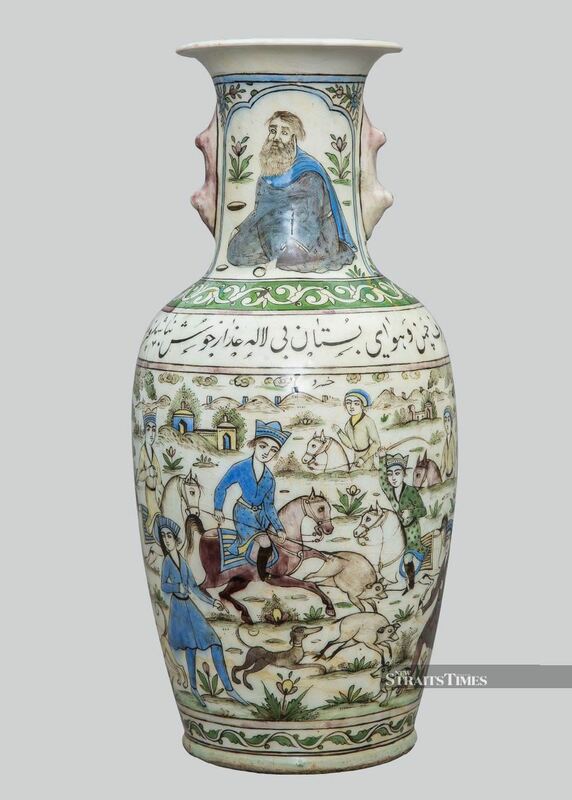 Many years ago I was told that studying Islamic art would mean a lifetime of looking at Persian pots. Although this fails to convey the enormous range of places and media that Muslim artists have represented over 1,400 years of creativity, it is a destiny foretold for this exhibition. 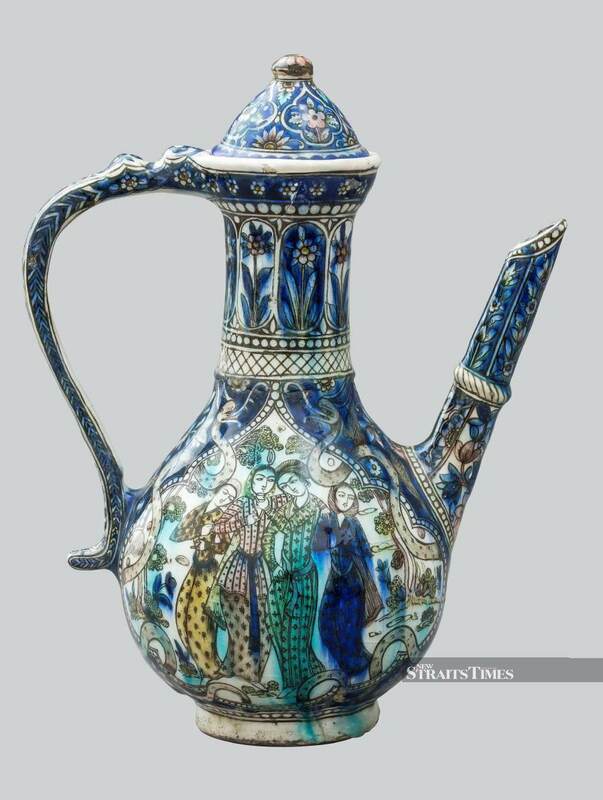 Qajar Ceramics - Bridging Tradition and Modernity is all about Persia. There are a lot more than just pots on display though; if anything, this was the age of the tile. Never has there been such an abundance apart from Portugal, possibly, which is now going through the nightmare of having its outdoor tiles removed by nocturnal thieves. The Qajar era (1789-1925) is not as well-known as the Safavids (150-1736). For most observers, this was the Golden Age of Persia, followed by Mongol dynasties such as the Ilkhanids. The Qajars tend to have been pigeonholed as progenitors of men with unreasonable beards and women with mono-brows. Their artists loved painting people who don’t really meet the modern standard of physical perfection. Look more closely, however, and you’ll notice that those beards have a hipster-plus dimension that makes them almost current. There is also a gender-fluid quality to those males who don’t have facial hair that reaches to their waist. It’s a curious meeting of macho and androgynous that somehow matches the spirit of the time. As the exhibition title suggests, 19th century Persia – as it was then called – was balanced between tradition and modernity. In some ways, this was repeated in the time of the last Shah of Iran, who fled the country in 1979 after modernising too rapidly for the traditionalists in his country. Ever since then, it has been run by clerics who didn’t tolerate the approach of the last Shah, and wouldn't think much of his 19th century predecessors. The Qajars were great experimenters. Like their counterpart in Siam at the time, King Chulalongkorn, they had much regard for science. Photography, education and constitutional reform were much to their taste. They enjoyed foreign travel and Western clothing. Their art was a sometimes bizarre amalgamation of millennia of precedent and the latest Western trends in interior design. New techniques, new subject matter and new markets meant a vigour that has rarely been matched anywhere at any time. This exhibition also breaks new ground. Other museums have had a chance, but fortunately it is Malaysia that can claim to be at the cutting edge in understanding an art form that has consistently been ignored. 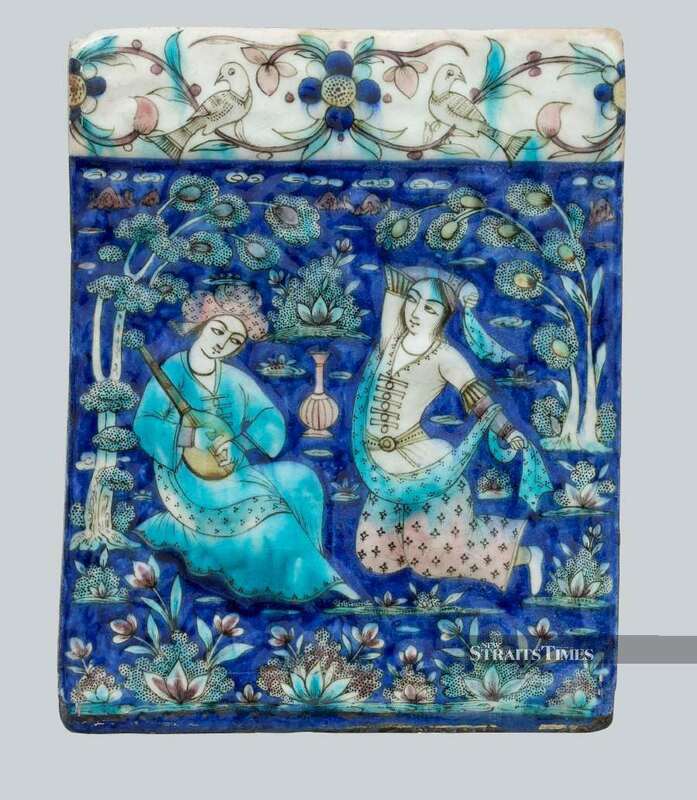 Countries that have had Qajar exhibitions recently include the Louvre in France, which seems to have overlooked the special presence of Qajar ceramics. Perhaps the output might be considered kitsch by the purists of Paris – or to be precise, the northern city of Lens, where the Louvre has created a satellite museum. 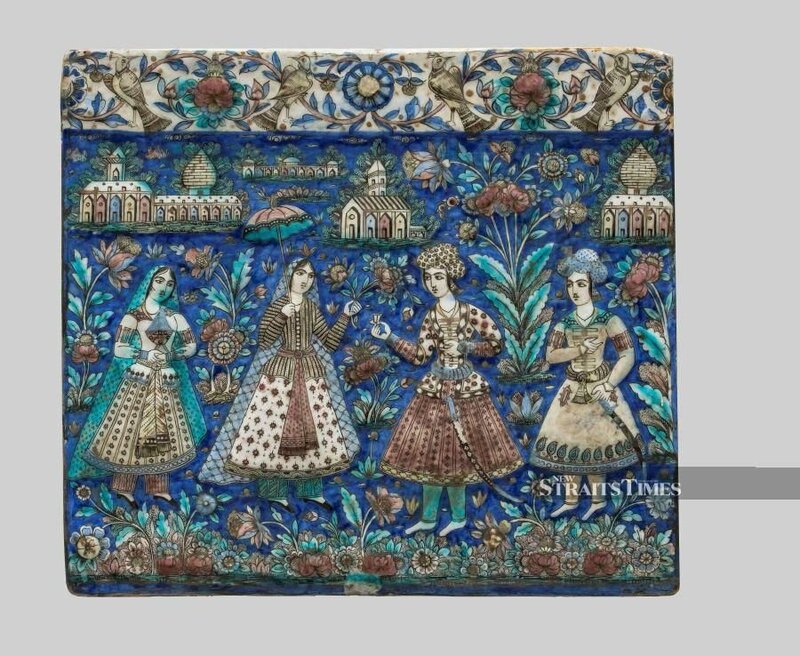 The publicity material declared “…this comprehensive overview of Qajar art brings together paintings, drawings, jewellery, enamels, rugs, clothing, photographs and ceremonial weapons.” But what happened to the ceramics? 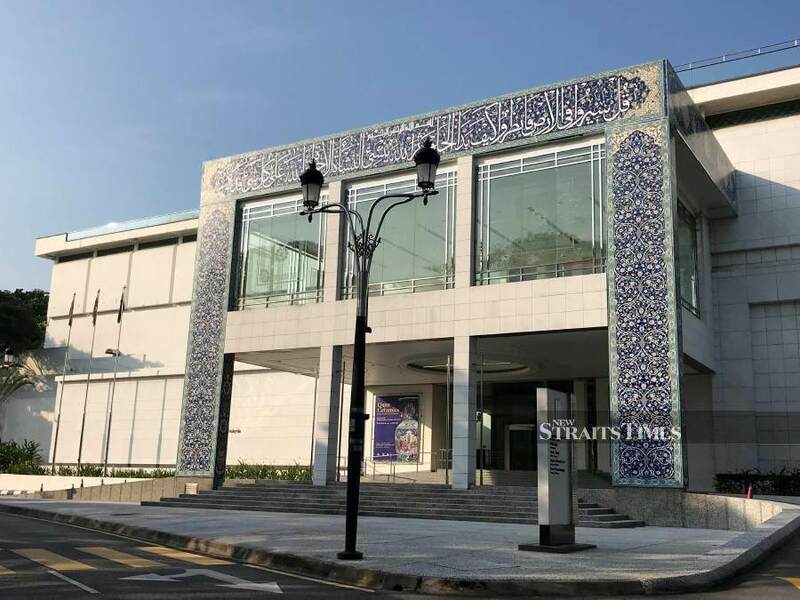 At least the Louvre had Christian Lacroix to design the exhibition, which is a factor the Islamic Arts Museum Malaysia is lacking although it has produced a very creditable display nonetheless. The lack of interest from other museums has put Malaysia on the Qajar cultural map. I hope the cultural authorities in the Islamic Republic of Iran have taken note. In addition to a stunning display, there’s more scholarship in this exhibition than I have seen in many top Western institutions – and it is highly original. 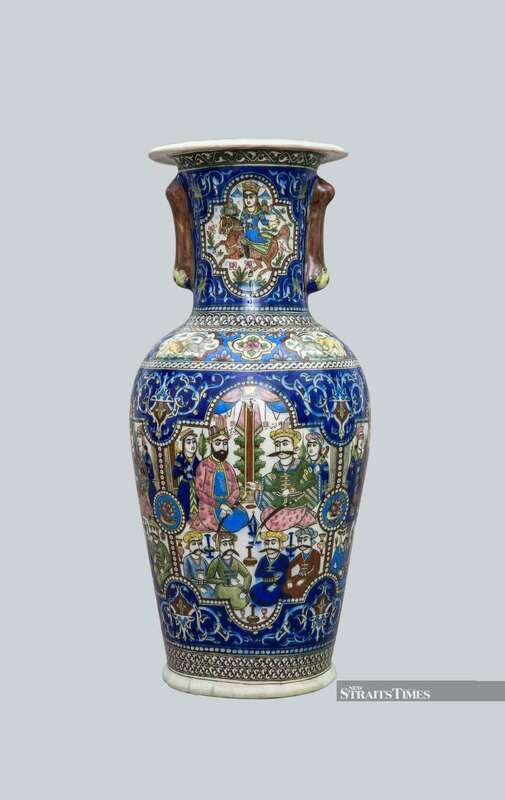 If you can’t see the show, seek out the catalogue: the dazzling colours produced by Qajar ceramicists come through as well as on the printed page as when seen through a showcase. For ceramics lovers who really want to learn more, there is a list of every known artist in the field at the time. We don’t necessarily know much about them, but at least their existence is being acknowledged, rather than being swept under the good-taste carpet. Carpets, by the way, are not part of this story. Although there were weaving innovations at this time, the focus at this exhibition is all on ceramics. From the point of view of colour and dynamic design, it’s quite a revelation. It illustrates a time when Persia was not a hermetic kingdom, withdrawing from the world. It embraced world fairs, along with international trade, art and tourism. 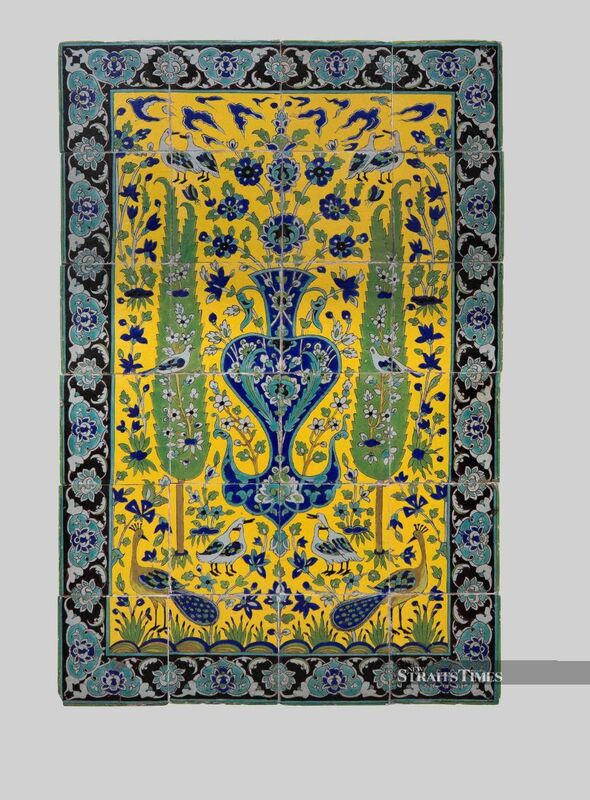 Persia was seen by the West as much more than a carpet manufactory. The Qajars looked back to their Safavid predecessors as well as to the distant pre-Islamic past. There are images of stiff-looking rulers, seemingly perfect Victorian, as well as mythical beasts and heroes. The Qajars were romantics with plenty of leisure time. Their ceramics exude luxury without too much pomposity or religious posturing. Above all, they brim with charm and joie de vivre. They learnt a bit from the French but more from their own past glories and current inventiveness. The last word should go to a Frenchman with an appalling record in Europe. Arthur de Gobineau was more than the definitive racist; he was the founder of the pseudo-science that was later to influence Hitler. At the same time he made a long visit to Persia and was full of praise for the people there. What shocked him most was that the Persians appeared, in his eyes, to treat people of all colours alike. You can’t get more contemporary – in aspiration at least – than that. 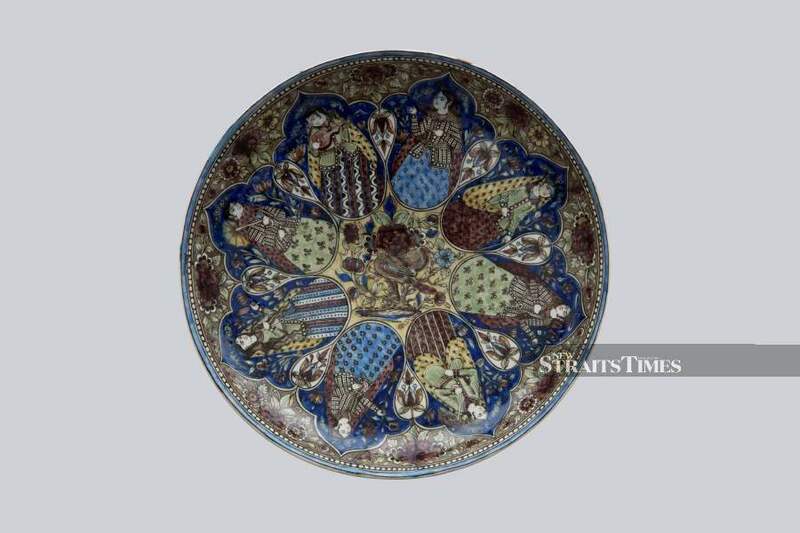 Qajar Ceramics – Bridging Tradition and Modernity is part of the year-long celebration of IAMM’s 20th anniversary. Until Dec 31, 2019.